The official Washington Redskins responded to the "Redhawks" campaign by saying they would not change the team name. The internet was buzzing with big "news" on Wednesday. After years of controversy and criticism, the Washington Redskins were reportedly changing their name to the Redhawks. The problem with the news was that ... it wasn't true. The Native American activist group Rising Hearts was behind the "Redhawks" campaign. Fake websites were even designed to spread the cause. This form of protest is called "culture jamming," and it works by subverting advertising and media content to critique well-known logos or brands. In this case, the brand was a football team's name: the Washington Redskins. Oxford Dictionaries considers "redskin" dated and offensive. White settlers first used the term to describe Native Americans, though some Native American chiefs did end up using it in the 1800s. In 1972, a delegation of Native American leaders urged the former president of the Redskins to change the name. That didn't happen, but the team did change its fight song, which included the phrases "scalp-um" and "beat 'em." This conversation about the team name, and the resulting discrimination reported by Native American youth, is continuing today. With Wednesday's Redhawks campaign, activists hoped to show "how easy, popular and powerful changing the name could be." Judging from the responses on Twitter, the name change story did garner some positive reactions. 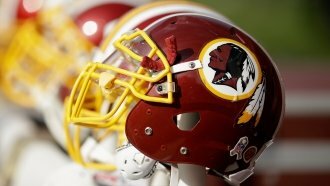 The official Washington Redskins, however, responded with a statement saying the current name would remain. 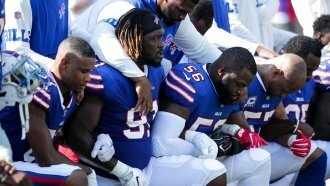 Current and former officials with the team have argued the name isn't negative, and that it's connected to the team's history and heritage. Because of that, it's unlikely the Redskins will change their name in the near future. Still, because of the popularity of the Redhawks campaign, don't be surprised if you see that fake name again.